Garden of Eden and Free Will – What will matter in a hundred years? Artist rendering – no historical accuracy implied! 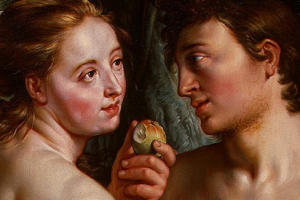 The Genesis 2-3 story* of Adam and Eve in the Garden of Eden is often interpreted as a fall from grace into original sin because they ate the forbidden fruit from the Tree of the Knowledge of Good and Evil. This can also be seen as the first act of free will. The fact that story does not have God wiping the slate clean and starting over was a gift saying that we could exercise that free well. Of course, we would no longer be taken care of in the way we were while we were in the Garden of Eden, so we ended up with the real world and its consequences. However, free will is such a great loving gift. If you consider how healthy parent raises a child from absolute dependency of infancy to greater and greater levels of Free Will and autonomy as they grow older, this is the loving way to raise a child. Why would God be any less loving? Now, a healthy parent allows skinned knees and broken hearts, we protect our children from the serious damage, but we allow (or cannot prevent) some pain. That does not mean that the parents are not loving. Life is meaningful because we are not puppets on strings. I am grateful for free will! *I see it as metaphor. We know it’s a myth because the snake talks!